Stop chasing weight! The DST30P Wheel Balancer features incredibly fast floor-to-floor times and calibrates the minimal weight adjustment for a perfect balance—in just six seconds flat. This item ships directly from the factory.Direct shipping points only.Surcharge may apply to rural & interline points. The DST30P accurately and efficiently calibrates wheel and tire configurations. Like the DST-2420 wheel balancer, the DST30P handles wheels up to a 30” diameter. It also contains many of the same working components as the DST-2420 but with one exception: we took the 64-tooth magnetic transducer encoder from the DST-64T and built it into this smaller unit for minimal yet incredibly precise wheel weight placements. The larger encoder features precision-cut square teeth to convert rotary position to a digital electronic signal, quickly achieving maximum profile and top-dead-center positioning. As part of our ongoing mission to supply shops and garages of all sizes, we reduced the unit’s footprint by narrowing the chassis. If you’re looking for more precise measuring than the DST-2420 and don’t desire the digital frills, add-ons and increased body size of the DST-64T, the DST30P is the perfect wheel balancer for your shop. It’s a cost-effective hybrid unit that offers the most precise readings you’ll ever generate from a wheel balancer. The Direct-Axis drive system helps keep the DST30P running smoothly over time. A single belt connects the motor and unbalance sensor, eliminating most maintenance costs during your wheel balancer’s many years of service. The DST30P doubles the potential placement for wheel weights while maintaining a space-conscious and highly cost-effective shop solution. Dynamic, static and ALU balancing modes are standard on each unit, featuring dual plane calibration for all OEM configurations and performance wheels. Ranger’s proprietary Digital Sensor Technology offers a 16-digit digital sensor processor and single-chip technology for better speed and accuracy in your readings. OEM and performance wheels require this sort of sophisticated technology for proper balancing, so be sure any wheel balancer you choose is fully capable of servicing these specialized wheel types. Single-chip circuit board architecture upgrades performance and reliability over multi-chip installations, (e.g., latency reductions, substantial boost in device throughput). A speedy, dedicated hyper transport protocol lets data communicate with the micro-processor much faster than would otherwise be possible. Single-chip boards also use less power and better dissipate heat. Dual-component piezoelectric quartz load sensors and digital rotation encoder measure longitudinal, transversal and shear effects for multi-directional force unbalance detection. The piezoelectric force sensors are the most sensitive sensors we have ever made, offering superior stability and fatigue resistance for unlimited service life with your wheel balancer. High-rigidity quartz crystal sensors offer high frequency detection in all three measured directions. A diverse arrangement of hardened-steel mounting cones lets you work with virtually all wheel types, including most light trucks and SUVs. A rubber “quick-nut” bell adapter, with a non-marring rear cone mount pressure cup, holds mounted wheels securely in place and is sure not to damage tires or wheels during balancing procedures. The DST30P wheel balancer tooling package includes car and light truck cones, as well as a heavy-duty truck cone and spacer ring. This package includes three “smaller” cones: 1.75” - 2.75”, 2.75” - 3.50” and 3.50” - 4.25”, as well as one truck cone 4.50” - 5.00”. Once an optional accessory, the truck cone package is now standard. The double-sided centering cone fits hub sizes 4.75” – 6.75”. Put simply, Ranger wheel balancers easily accommodate most OEM and aftermarket wheel configurations. A tape weight feeder is located conveniently on a side-shelf that’s built into the wheel balancer. You’ll never have to worry about losing or misplacing your Ranger easy-to-peel adhesive tape weight. The weight calculations on the DST30P wheel balancer are more accurate than the DST-2420—twice as accurate, in fact! We’ve taken something great and made it even greater, now balancing your tire and wheel configurations with the most precise placements possible. The 64-tooth magnetic transducer encoder offers more precise placement readouts by making it easier to achieve maximum profile and top-dead-center positioning. This means you use less weight while you save more time, increasing your bottom line. We’ve taken the touch-pad display panel on the DST-2420 wheel balancer and raised it up, tower-style, for the DST30P. This design improvement offers more flexibility in how you work. The extended, fully adjustable display avoids the problem of glare that can shroud readouts on the screen, and it ensures differently abled operators will enjoy a more ergonomic experience as they calibrate tire and wheel configurations. Highly visible LED displays show you exactly where to place the weights in seconds flat. These LED indicators let you see weight positions when the mounted wheel is rolled top-dead-center. As mentioned, the DST30P features an improved encoder wheel over the DST-2420, which means the LED display on the DST30P is more sensitive and more accurate than ever before. When you buy any one of Ranger’s wheel balancers, you get a starter set of wheel weights included with your purchase. The kit has one bulk roll of 100 silver adhesive steel tape weights and 100 black adhesive steel tape weights. We also include one starter box of mixed clip-on steel weights. Of course, additional weights can be purchased in these bulk packages at your convenience. 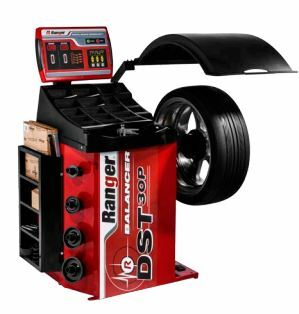 Click the button below to add the Ranger DST30P Wheel Balancer / 36mm Shaft / 110-240V, 1-Phase, 50/60hz to your wish list.